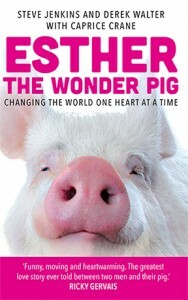 Steve Jenkins was working as a Realtor and living with his partner, Derek Walter, a professional magician, when their life was flipped upside down thanks to a beloved pet pig named Esther. Never ones to back down from a challenge, Steve and Derek buckled up for the ride of a lifetime, turning Esther the Wonder Pig into a social media powerhouse. In just two short years, Steve and Derek have cemented a place for themselves among the world’s most well-known and successful animal activists, accumulating hundreds of thousands of followers all over the world. In 2014, Steve and Derek founded the Happily Ever Esther Farm Sanctuary in Campbellville, Ontario, where they continue to rescue and rehabilitate abandoned and abused farmed animals. Caprice Crane is an award-winning, internationally bestselling, five-time novelist, screenwriter, and television writer with her finger on the pulse of pop culture. With a voice noted for being as witty as it is relatable, Caprice’s humor and satirical observations have earned her a wildly loyal social media following and the distinction as one of the Huffington Post’s “50 Funny People You Should Be Following on Twitter.” Her debut novel Stupid and Contagious was published in fourteen countries and Caprice was awarded the 2006 RT Reviewers’ Choice Award. She followed that success in 2007 by winning the same award with her equally clever and comedic second novel, Forget about It, another international bestseller. She’s since published three more novels to critical acclaim including her debut YA novel, Confessions of a Hater, which received a love letter in the New York Times Book Review in fall of 2013.